First things first. I am not a lawyer. And this post is about legal stuff. I barely know how to spell indemnities. I had to double check that I was spelling it correctly. So I am going to put a bunch of stuff on the table but if you really want to understand this, talk to a lawyer. This kind of stuff is why you have a lawyer and why they are valuable. That said, here goes. When you sell your business you will make a bunch of representations to the buyer (reps). You will tell them you own all of the assets you have on your balance sheet. You will tell them that you have no more liabilities than you have listed on your balance sheet. You will tell them that you own all the intellectual property you claim to own. You will tell them that you have all the contracts with customers you claim to have. I could go on and on. The list of reps in a purchase agreement is long. This is a contract. You need to take this stuff seriously. If you are repping to something, you should be very careful and read every rep and make sure it captures the situation accurately. There will be schedules for most, if not all, reps. Read them too. You are making promises to the seller. Make sure they are correct. Reps are about what is true today. Warranties are about the future. You will also be asked to warranty a number of things in a sale contract. Read them carefully as well. Make sure you are confident of them. Lawyers write these contracts but people have to live up to them. So don’t just treat a contract as a piece of paper to be signed. Understand what is being agreed to, take the time to understand it. If you don’t understand it, make your lawyer walk you through it, line by line if need be. An indemnity is the amount of money that is to be paid from the seller to the buyer if any of the reps and warranties turn out to be false. They will be set up in the contract. 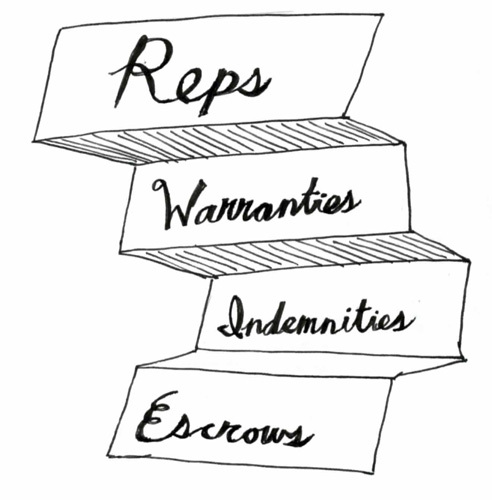 Understand how much liability you are taking on for the reps and warranties. The buyer will require a percentage of the purchase consideration be set aside to back up the indemnities, usually for one year. The percentage is most often 10%, but can be more or less depending on the type of deal it is. The escrow is the money the buyer can come after based on the indemnities without having to sue the seller. There will be an escrow agent represeting the selling shareholders. It is most often the lead investor. Our firm has done this many times. It is a thankless task, but an important one. If there is a fight over the escrow amounts or a larger claim, the shareholder representative will be the one dealing with the buyer. One area that has been particularly problematic in M&A for tech startups is IP reps, particularly patent issues. An announcement of a large purchase of a tech company is a big fat target for patent trolls. The patent infringement suits will come out and the seller’s escrow will be the target. My partner Brad has been dealing with one of these for years. It is ugly. Most of the time, the escrow is paid without much haggling by the buyer on time (usually a year later). But sometimes the buyer has legitimate claims and the escrow is used up paying the indemnities. It is rare (at least in my experience) for the buyer to come after more than the escrow. That is most common in outright fraudulent transactions. In summary, you will be asked to make a bunch of statements of fact and future performance to the buyer when you sell the company. Take them seriously and make sure you understand what you are signing up to. Be prepared to set aside at least 10% of the purchase price to back up these statements. And if things go wrong, expect to lose some or all of that 10%. Ahh, a great subject and one I could write on for days. Here are a couple of pragmatic tips as I have dealt with these type of issues forever. Know the difference between a rep and a warranty and when they are used and what the knowledge standard is for each one because it is typically different. A rep is typically to the “best of your knowledge” meaning it is only what you really know and does not require any inquiry on your part. A warranty is typically “absolute” meaning it doesn’t matter whether you know it or not. You are responsible for the truth. A rep is typically in a Purchase and Sale Agreement while the same issues are typically warranted in a Stock Exchange Agreement. One is thought of as being “contractual” while the other is more of a “securities” issue. Classic example — street is wet in front of the building. Why? Rep — “it rained” — ooops, street sweeper came by. No problem as you did not have actual knowledge. You are off the hook. Warranty — “it rained” — ooops, street sweeper came by. Big securities problem because you do not get a pass based upon knowledge standard. A warranty is absolute. Big idea: never, ever, ever rep or warranty anything a buyer could find out through his own due diligence. If you give the buyer the unfettered opportunity to satisfy himself on the issue, then you should not be bending over backwards to rep or warrant anything he can find out or otherwise satisfy himself on. At the very least, make damn sure to create an exhibit showing what the buyer did for his own due diligence so that if there is a future issue you can at least argue that he investigated it himself at the time and did not object. They will not send you more $$$ if they surpass their own financial projections. I promise you that. This article was originally written by Fred Wilson on February 28, 2011 here.